The State of Wisconsin, highlighted on the map in red, is bounded by Lake Superior on the north, by Illinois on the south, by Lake Michigan on the east, and by Minnesota on the west. Wisconsin is bordered by Michigan on the northeast and by Iowa on the southwest. Wisconsin is the 25th largest state in the United States, with a land area of 54,310 square miles (140,663 square kilometers). Many of the state's 72 county names, such as Winnebago, Menominee, and Kickapoo, are derived from the names of Wisconsin's native tribes. This Wisconsin map site features road maps, topographical maps, and relief maps of Wisconsin. The detailed, scrollable road map displays Wisconsin counties, cities, and towns as well as Interstate, U.S., and Wisconsin state highways. The pannable, scalable Wisconsin street map can be zoomed in to show local streets and detailed imagery. to view a scalable Wisconsin road map. The detailed Wisconsin map and the regional Wisconsin map display cities, roads, rivers, and lakes as well as terrain features. The detailed map shows only the State of Wisconsin, while the regional map shows Wisconsin and the surrounding region. Wisconsin's capital city is Madison. Other major Wisconsin cities include Milwaukee, Green Bay, and Kenosha as well as Racine, Appleton, and Oshkosh. In 2005, the population of Wisconsin was estimated at 5,527,644, which is about 101.9 people per square mile. In 2010, Wisconsin's population rose to 5,686,986 people. The state's Interstate Highways include I-43, I-90, and I-94. Wisconsin is derived from the Chippewa word "Ouisconsin", which means "gathering of the waters" or "grassy place". Much of Wisconsin's terrain consists of rolling plains, dotted with many glacial lakes. In the north, the scenic Gogebic range straddles the Wisconsin-Michigan border region. The Wisconsin, Saint Croix, and Chippewa are the state's chief rivers. Tourists are drawn to the natural beauty of the Apostle Islands National Lakeshore and the Saint Croix National Scenic Riverway, as well as historic landmarks such as the National Railroad Museum and the Wisconsin Maritime Museum. For additional Wisconsin travel and tourism information, visit the official Wisconsin tourism site and Wisconsin Atlas. This Wisconsin reference map shows major cities, roads, railroads, and physical features in Wisconsin. 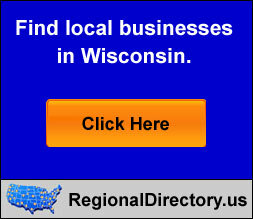 Several map publishing companies offer printed maps of Wisconsin. For example, Omni Resources offers several maps of Wisconsin that feature points of interest, airports, and parks, as well as selected local attractions and insets of major Wisconsin cities. Wisconsin-Map.org Editor, State Maps, PO Box 775, Barnegat, NJ 08005.